Thrunton Nugget sold for 13,000gn. Charolais bulls sold to a top of 13,000gn at the closing day of the Stirling Bull Sales. An average of £6,171 was achieved for 121 bulls – a clearance rate of 85%. This compares to last year’s average of £7,635 for the 115 bulls at a clearance rate of 88%. 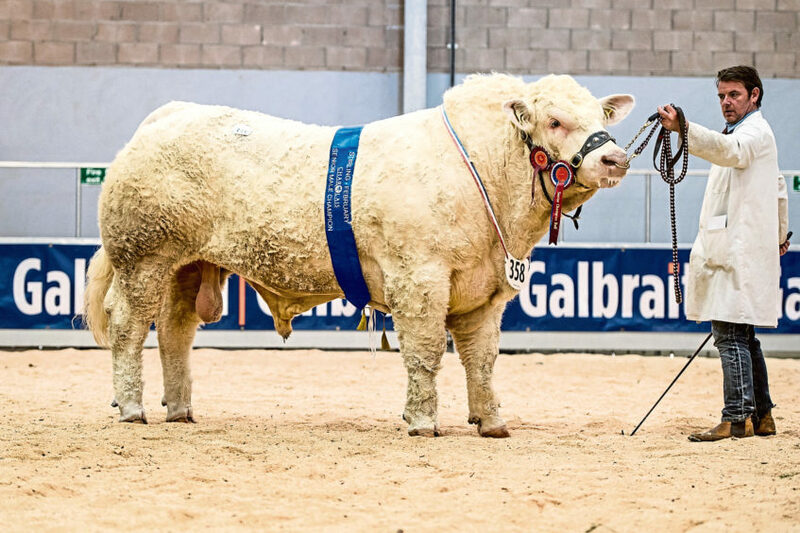 The sale leader was a first-prize senior bull from J H C Campbell & Sons, Thrunton, Alnwick. May-2017 born Thrunton Nugget, by Thrunton Gladiator and out of Thrunton Hoopla, sold to K J Thomas, Llechwedd, Wales. Next best at 12,000gn was the senior champion, Inverlochy Nelson, from father and son Johnny and Raymond Irvine of Inverlochy Farm, Tomintoul. Inverlochy Nelson sold for 12,000gn. A May-2017 born son of the Irish-bred Kilbine 1 Instigator, he sold to the Wights at Midlock, Crawford. Thereafter three lots sold for 11,000gn. 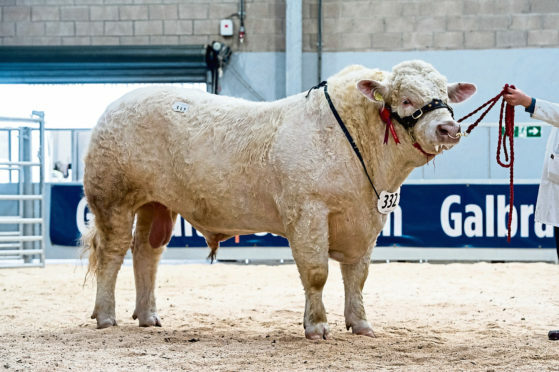 The first, selling to John Smith, Netherton Farm, Peterhead, was June-2017 born Gretnahouse Neverland, by Westcarse Jimmy, from Gretna Green breeder Alasdair Houston. The second was August-2017 born Harestone Nighthawk from Neil and Stuart Barclay, South Road, Insch. An ET son of Balmlye Edition, he sold to J G Wilson, Kinclune, Glenkindie. The third, selling to G A Mackie, Drimmie Farm, Rescobie, Angus, was October-2017 born Goldies Navigation, by Gretnahouse Heman, from Hamish Goldie, South Bowerhouses, Ruthwell, Dumfries. Harestone Nighthawk sold for 11,000gn. Next best at 10,500gn was September-2017 born Killadeas Noah, by Blelack Blackberet, from S & D Bothwell, St Angelo, Co. Fermanagh. He sold to J Warnock & Sons, Dreva Farm, Broughton. Other leading prices included 10,000gn for October-2017 born Thrunton Nike, by Thrunton Gladiator, from the Campbells. He sold to A J Maclean, Heylipol Farm, Scarinish, Tiree. Five lots sold for 9,500gn, including the reserve overall champion from Major David Walter, Balthayock, Perth. Brought out by Davie and Tracey Nicol, Balthayock Nanook, by Balthayock Imp, sold to W J Millar, Hunting Faulds Farm, Tealing. Another entry from Major Walter made 9,500gn when Balthayock Nominee, by Balthayock Impression, sold to Mr Timm, Westend Farm, Appleton Roebuck, York. Hamish Goldie was also behind two of the 9,500gn bids. Goldies Nugget, by Gretnahouse Heman, sold to A & J Wilson, Mains of Tillymorgan, Culsalmond, and Goldies Noelle, by Goldies Formidable, sold to Strathisla Farms, Moolies Meigle, Ruthven, Perthshire. The last lot at 9,500gn, selling to D Munro, Pitmain, Kingussie, was Woodpark Neptune, by Deeside Gulliver, from W Short, Wood Park, Co. Tyrone. 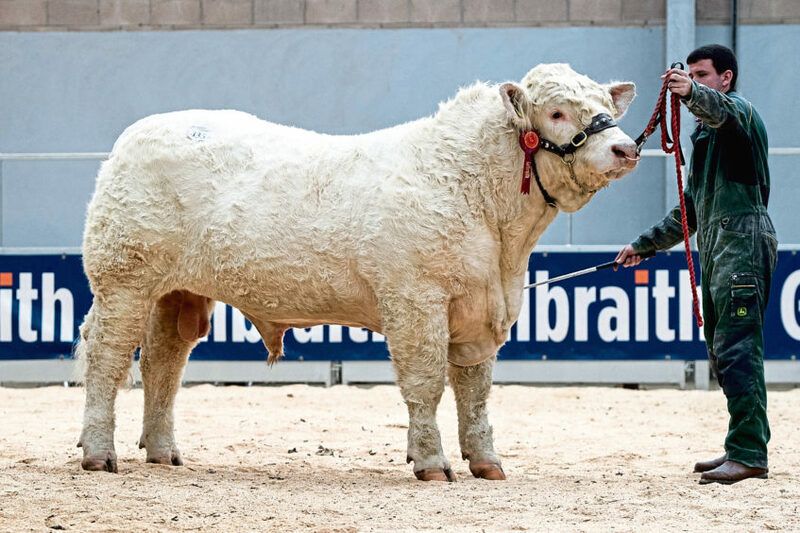 The overall champion – Maerdy Northernboy from Esmor Evans – was unsold at 7,800gn.